In less than 48 hours of a “sobering” G7 meeting in Charlevoix (Canada), as Chancellor Angela Merkel said later, “stable genius” lashed out at the host Justin Trudeau (“dishonest and weak” because the Canadian leader defended his country); broke with US longstanding allies, backtracked on the “painstakingly negotiated” conclusions and left early, “excited” to meet the most brutal dictator on the planet. Once again, the casus belli was trade imbalances and his unfounded perception that the US is being cheated by everybody. Trump rejected to stamp his signature on a communique that simply stated the obvious: “the crucial role of a rules-based international trading system”. The sentence, as other references to rules-based international order, were also included in the G20 conclusions in Hamburg, signed by himself. But in Hamburg, leaders already had an appetitive of what was coming as Trump rejected supporting the joint statement on the Paris commitments against climate change. Trump’s ultimate goal seems to be trashing every alliance and international agreement he finds on his desk. And by doing it, he is cracking the Western community like no other leader did in peace times. In his view, he has embarked on a fairness crusade. But his attacks against women, Muslims, Mexicans, media, his own administration and judges, his predecessors in the White House, fellow leaders, trading partners, allies, and a long list of victims prove how absent this value and other principles are in his moral compass. As Twitter and TV programmes aired the “most dysfunctional G7 summit by a long margin” since the countries started meeting in 1975, as Eurasia’s Ian Bremmer put it, the scary question is how bad it could go before it gets any better. The situation will improve only when he leaves, because we can hardly expect he would fall off his horse on his way to Damascus. If Democrats fail to impeach him, depending on the results of Robert Mueller’s investigation into the Russian affair, worse things could come in the next two years and a half. Trump warned us that “change is coming”, which means he is ready to shoot again. Following his tariffs on steel and aluminium, the next target could be the car exports to the US market, as he hinted at plans to balance the trade deficit. But his ‘America First’ would not stop with trade relations. The Paris accord or the Iran deal are warning signals of his shoot-on-sight policy. We could feel relief that there has not been a major international crisis where his skills and temper were tested. Does anybody doubt that we would be living on a radioactive planet if he had been in the Oval Office during the Cuban missile crisis? The expected strategy of isolating Trump may be the only option, although a risky one. The US’s weight is too big to be ignored and Trump could react by redoubling his attacks on the grown-ups like a grounded kid. After trying all options, including bromancing (Macron), leaders have no options left apart from containing the damage after they realised that the US President is no longer an ally to the principles and values they represent. “In the G7Charlevoix, President Trump saw that he had a united front in front of him,” said Macron. An “isolated” US is contrary to its history, he added. Only American voters or their congressmen could amend this regrettable chapter of the American saga. The turbulent G7 summit (or G6 + 1, if you prefer) managed only to escalate into a new diplomatic and trade crisis, including between US and Canada. 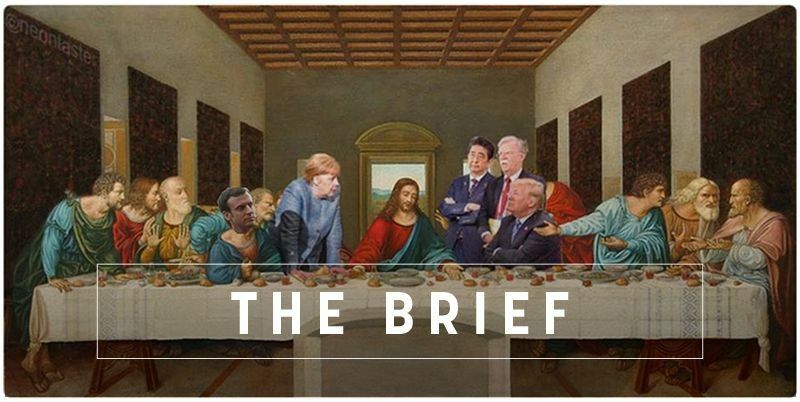 Twitter User @neontaster – a self-declared photoshopper of memes – captured the sentiment with his version of “The Last Globalist Supper“. Meanwhile, Trump dashed across the globe to meet Kim Jong-un for super-important talks on North Korea. Fraser Cameron gives his take on the Summit of the Year. Don’t aim too high on clean energy targets. German Energy Minister Peter Altmaier says voters across Europe have lost faith in politics partly because of “unachievable targets” on renewable energy, pouring cold water on the EU’s energy ambitions. Uber’s Europe chief admits to our Jorge Valero that the company has made some mistakes and is now listening to its drivers and policymakers. Conservative Social Democracy? Former Danish Prime Minister Helle Thorning-Schmidt appeared in Brussels, saying the EU should step out of Washington’s shadow but also review its policies on free movement of labour and migration. Brexit dream all but dead? Denis MacShane writes that Borison Johnson and David Davis are being sidelined by a Tory push for more pragmatism, which means “continuing the current customs unions and single market arrangements into the 2020s”. More jobs needed. With less than a year before the next European election, EU stakeholders and MEPs attending a EURACTIV event expressed the need for the EU to create more and better jobs, going hand in hand with the need to have more funding. Leaving the sinking ship. Faced with an increasingly likely implosion of the ECR group in the European Parliament after Brexit, Poland’s ruling PiS party is looking to join the EPP. European Parliament in Strasbourg discusses the priorities for the 28-29 June EU Summit, as well as the future of Iran nuclear deal with Federica Mogherini.